Higher intakes of red meat have been linked with a number of health problems, including type 2 diabetes. Research is showing that food processing is a key factor involved in the increase of risk. Red meat in a pure form is a good source of protein and B vitamins and has been a key part of the human diet. Red meat is a popular food amongst those following a paleo diet, in which food choices are guided by judging which foods would have been available to our ancient ancestors. Followers of a paleo diet will often try to seek food that is unprocessed and where the animals have been fed a natural diet. The Department of Health advises people to consume 90g or less of red meat per day. A thin slice of pork, lamb or beef the size of half a slice of bread provides about 30g of meat. Red meat is a rich source of protein, saturated fat, iron, zinc and B vitamins. Iron is needed to help red blood cells transport oxygen. Iron deficiencies are more likely to occur in children, elderly people and pregnant women. Iron is also available dark green leafy plants, beans and grains but is best absorbed by the body from red meat. Zinc is required by the body for DNA synthesis and helps the immune system to function effectively. As well being found in red meat, zinc is also found in fish, grains, eggs and beans. However, zinc is best absorbed from meat and fish sources. Amongst the B vitamins found abundantly in red meat are vitamin B6 and vitamin12. Vitamin B6 is beneficial for the immune system and vitamin B12 beneficial for the nervous system. People taking the diabetes drug metformin have an increased risk of having lower levels of vitamin B12. Consumption of red meat has been linked with increased incidences of heart disease, colorectal cancer and type 2 diabetes. The extent of the associations have found to be higher for processed red meat. In 2011, a study by Harvard University made news headlines when it published a study which suggested that eating unprocessed meat was associated with an increased risk of type 2 diabetes. The risk of diabetes was 20% higher in those that ate over 110g of unprocessed red meat a day. However, the research attracted some criticism for including hamburgers within the unprocessed foods list. Of those that ate a serving of processed meat, the risk of type 2 diabetes grew 50% higher. Processed red meat includes meat products that have been cured, pre-cooked, comminuted or had preservatives and binding ingredients added. Many hams found in the supermarkets will have been treated with preservatives (such as nitrites) and may also be made from comminuted (ground) meat. 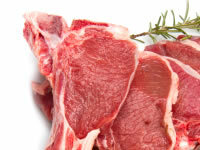 Raw red meat can carry dangerous bacteria so it is important that red meat is stored, cooked and handled appropriately. Wash your hands after handling raw meat and wash any utensils and crockery that have been used for raw meat. Red meat should not be reheated more than once to prevent food poisoning from occurring. When cooking red meat, heat it all the way through to ensure bacteria inside the meat is killed. Which foods for a healthy diet?